Langenhagen, June 2012 - No matter whether workshop or practice, freelancer or shared office space – smaller businesses are especially dependent on reliable quality, simple operation and a high degree of economy when it comes to copying. 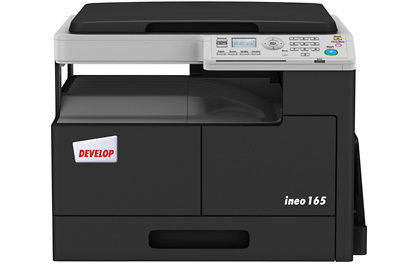 DEVELOP now has the ideal solution for this target group with the market launch of the ineo 165 and adds to this reliable copier printing and scanning functions! High printing speed is one important aspect: the standard GDI controller on the ineo 165 can process up to 16 pages per minute in consistently high quality! However, the other main criterion in terms of saving time is the level of difficulty in using a multifunctional system. Here, too, the ineo 165 offers a clear advantage. This is because user-friendliness was always the main priority from the very start of the development process. Thanks to its clearly structured and self-explanatory LCD display, it is also easy for inexperienced people to use. The innovative panel requires just a few cursor buttons; a shortcut button can be assigned to frequently used copier functions. What´s more error messages and a status LED provide visual feedback at a glance. The ineo 165 prints in black and white with 600 × 600 dpi, processes grammages of 64 to 157 gsm and all paper formats from A5 to A3, which means that creating clear design drawings, schematic diagrams or timetables presents no problem. The paper tray has capacity for up to 250 sheets, whilst the optional bypass tray can take a further 100 sheets. Another bonus is the TWAIN scanning function via a USB interface. What’s more, although the ineo 165 only requires floor space measuring 570 × 531 mm and weighs just 23.6 kg, it is nonetheless very stable. Energy costs often play a major role in small businesses – and this also applies to printing and copying. Yet some older devices even use energy when they are not in use. In addition, depending on the printing system, the price per page can also vary significantly. Here, the ineo 165 provides a persuasive argument in every respect. Its HD toner works at low temperatures and considerably curtails energy consumption. However, even when the system is in energy-saving or standby mode, power consumption and the associated costs are kept to a minimum. And that’s not all: the ID-card copying function also offers the option to print the front and reverse side of an identity card or driving licence on just one sheet of paper. The 2-in-1 and 4-in-1 functions work in a similar way: two or more originals can be copied onto a single sheet. This saves paper and is thus better for the environment. The Energy Star seal of approval confirms that the ineo 165 combines exemplary economic and ecological properties. This is a system that is as compact as it is efficient and economic, and can produce high-quality documents quickly and reliably. The ineo 165 is particularly advantageous for small businesses – thanks to the fact that it is simple to operate, it can be used in any situation and improves the flow of many work processes. Develop GmbH is a leading supplier of modern office communications solutions with independent distributors and resellers in about 60 countries worldwide. The company markets systems, software and services for document production and document management. With its existing range of offers, Develop has established itself as one of the leading suppliers to small and medium-sized enterprises. As a trendsetter, Develop is boldly and creatively helping to shape the future. As such, its understanding of consultation goes far beyond analysis and making recommendations: DEVELOP evaluates, designs and supports – with its primary objective being to increase productivity in the customer’s environment. In Germany, more than 300 authorised dealers provide nationwide coverage. The extensive distribution network allows the implementation of corporate client operations throughout Germany and ensures national service support for the products. DEVELOP GmbH is a wholly owned subsidiary of Konica Minolta Business Solutions Europe GmbH. The parent company is Konica Minolta Business Technologies, Inc., headquartered in Tokyo, Japan. With approximately 27,000 employees worldwide, Konica Minolta Business Technologies posted net sales of JPY 540.80 billion or approximately EUR 4.70 billion in the 2009/2010 financial year. Within the Group, DEVELOP GmbH is responsible for its own independent sales and marketing policy.